> As a puzzle fan, I enjoyed the puzzles in the game a lot. > The graphics are simple yet cohesive and effective. > I like that there is a fitting conclusion to the game even if it's short. The fact that you even managed to put a boss fight at the end that takes advantage of the mechanic is cool. > There are some bugs. I can get stuck on a wall sometimes. > The rotator animation could use some improvement. It looks a bit weird. Good job and thanks for this! Its simple, Its effective, and it has a more satisfying conclusion then I've seen in the other entries in this jam. The only critique I have is the part at the end with the crosshair feels a bit wonky. Overall though, solid game. I actually really liked this game. In fact, it was one of my favorites in the whole jam. However, I should mention that it took me a little bit before it grew on me, and I think the main reason for that is that you sold yourself short by comparing this game to VVVVVV. 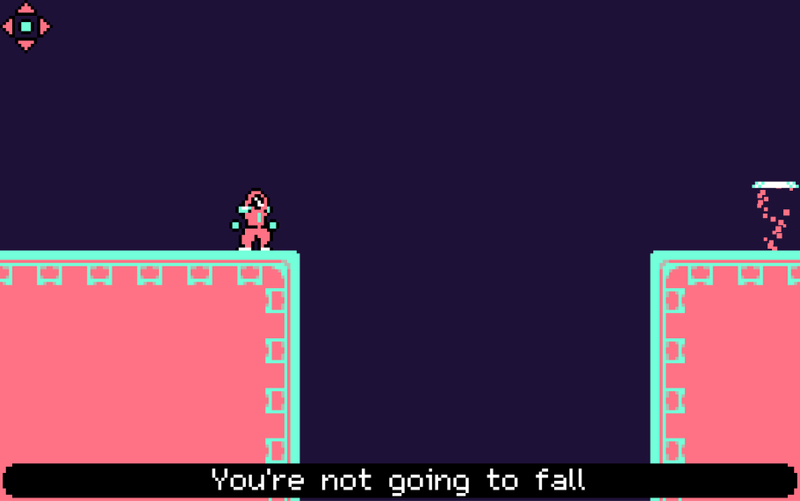 Yes, the gravity flipping mechanic is inspired by VVVVVV, but this is a completely different game. 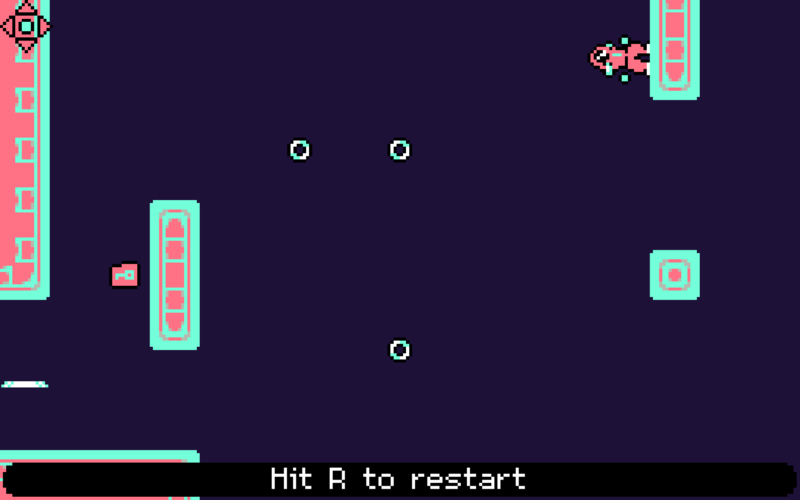 VVVVVV is an action platformer that is fast-paced and requries quick reflexes and thinking on your feet, so when you compared your own game to VVVVVV, that's what I was expecting. However, this game doesn't require action or fast reflexes at all. It's more of a puzzle game. It requires you to carefully plan out your moves before you start pressing any buttons. It's different, and while it's not what I was expecting, I really like it. It's a unique game with interesting mechanics and decent level design, and I think you're doing yourself a major disservice by comparing this game to VVVVVV. With some polish and with time to develop more levels, I think this game could end up being really cool :) I liked it! Keep up the good work! Very good game. The concept is not new, but there are some interesting mechanics that arose with the turn balls, and the graphics do a fine job. My entry has similar idea, but your game is better and more well designed. Good job. I thought the boss was intuitive because it showed you how to beat it when it shot its self letting you know what to do. The instinct I got has to destroy the rest of them. The only shame i found in the boss is it didnt include the round about things but was a minor thing. And the consequence of death is pretty small in this game and I think thats the only way to learn how do beat the boss is by death. And much like the other levels they came with trial and error as well so my personal opinion is the boss was a great ending. Fun mechanic and nice art. Is anything supposed to happen after the boss stops shooting, or is that the end? Really nice! 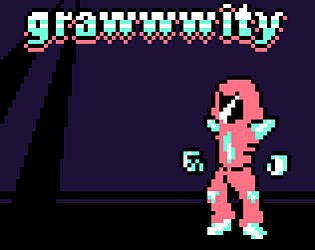 I liked the use of "gravity" flipping mechanics but without actual gravity. The few additional mechanics in the game nicely complimented the mechanics and added some very interesting challenges. The boss fight was nice and fun too, though I did die a few times for what seemed like no reason. Anyway great work! good colours and nice mechanics. if you walk off certain platforms on level six you might get stuck.